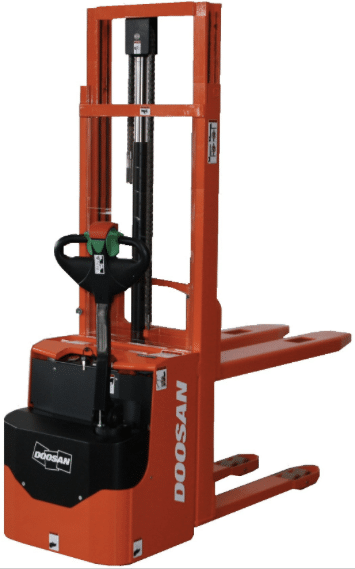 Doosan Industrial Vehicle UK has launched six new warehouse products, with two more due to launch in 2015. Built at Doosan’s German manufacturing facility just outside Berlin, the new Doosan warehouse range is manufactured in line with the company’s ethos of heavy duty, durable, no nonsense machines. Five of the six new products for 2014 are stackers, reflecting the growth in the pedestrian stacker market, with Doosan moving into new weight categories in response to ever increasing warehouse demand. With the launch of its new range Doosan now has stackers available in the most popular weight categories. The new LEDS 10C (1000kgs capacity) is a the smallest stacker that Doosan produce, with the LEDS 14 (1400kgs) series being rolled out and the brand new LEDS 20 (2000kgs) debuting at the top end of the line up. Standard features in the LEDS range of Doosan stackers include an energy saving sensitive proportional hydraulic system, shock-free lowering by hydraulic damper and vulkollan drive and load wheels. The final new product, and outside of the stacker range, is the 2.5 tonne hand pallet truck which comes in six configurations including stainless steel, high lifter, low profile, and digital weigh scale versions. These new products are joined in 2015 by the LEDH 30 – a 3000kgs powered pallet truck –and the LEFD 12.5, 1250kgs capacity stand-in stacker. “The warehouse product market is booming and our reliable, easy to use and durable new range now offers operators in the UK and across mainland Europe with a real high quality and cost effective choice for their businesses”, concludes Paul Watson.